Call 970-255-8890 to get your big-brake big break today! 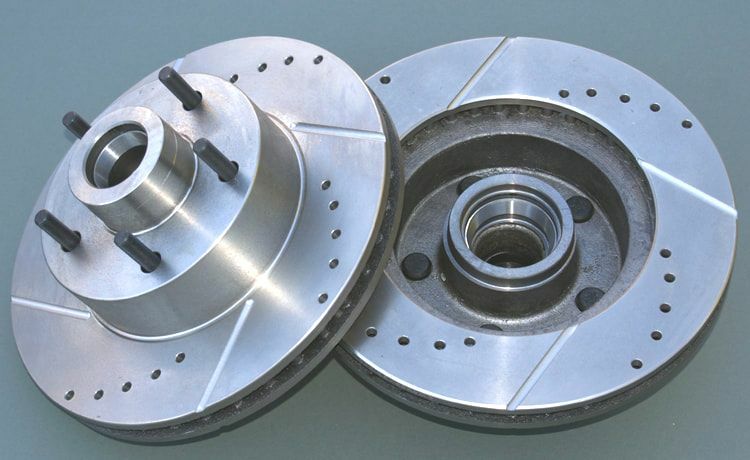 How about these ultra-efficient racing-style drilled and slotted 11-inch rotors? 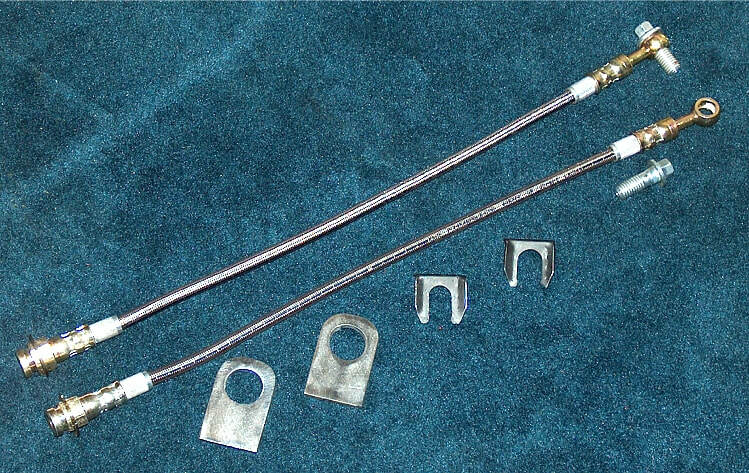 If you use your brakes hard and need better heat dispersion and lower risk of warping, these are for you! 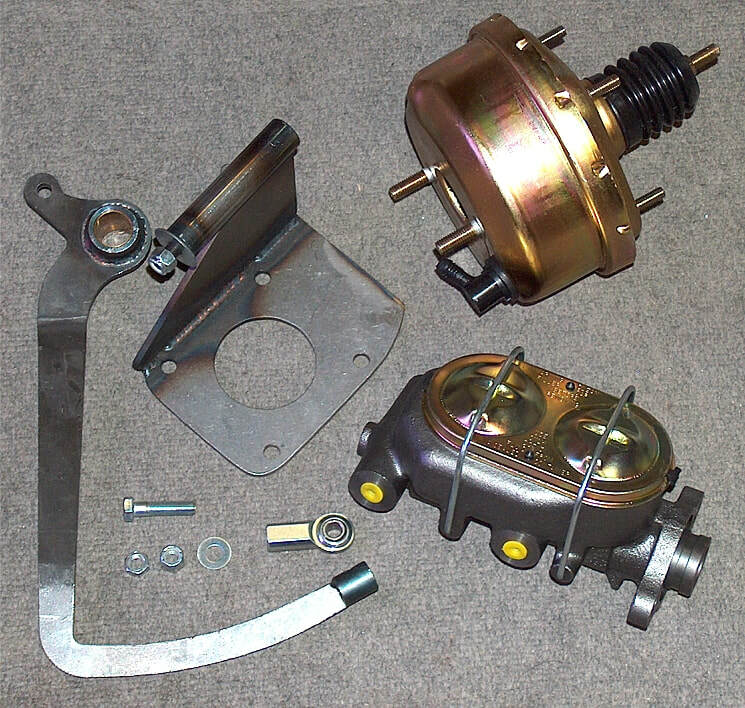 Only $129.95/pair + S&H or add $80 to the Big Brake Kit price. Dress up any Mustang II IFS Brake setup with our new one-piece caliper brackets. 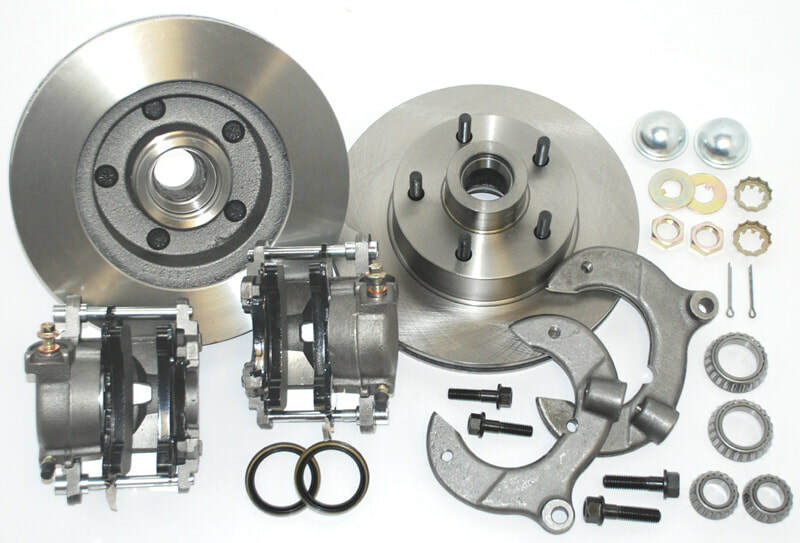 FDL Big Brake Front Hub Kits provide the advantage of larger diameter brake rotors for traditional non-ABS spindles on American muscle cars and vintage rods. 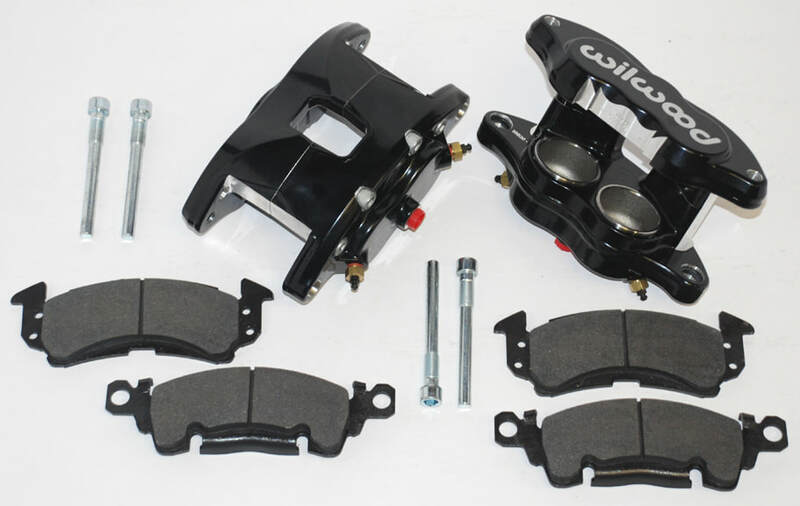 Forged billet Dynalite calipers, 12.19” diameter rotors, and high performance Wilwood brake pads generate big brake stopping power on all types of custom show and performance street / strip machines. A full range of options for caliper finish and rotor design provide custom builders with the ability to personalize the style and performance requirements of the mildest to the wildest machines. Call 970-255-8890 to order! 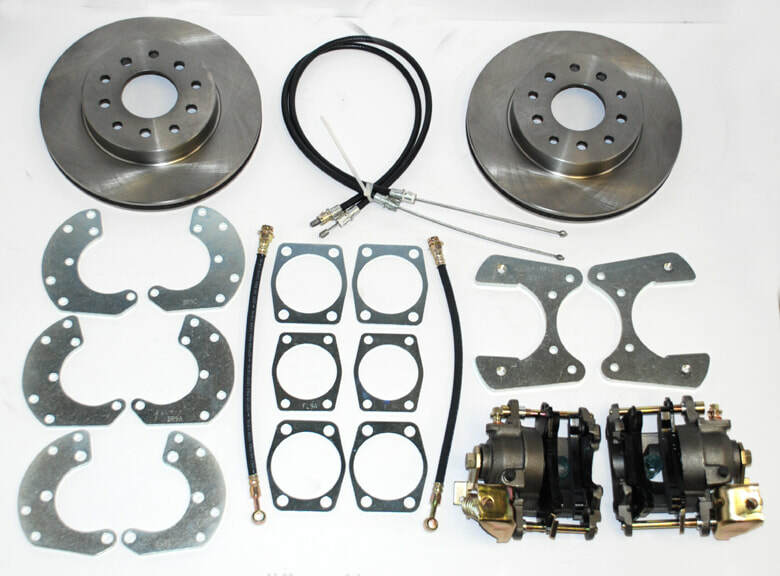 Our Rear Disc Brake Kit fits 8" and 9" small- and Big-Bearing Ford rear ends, and 10- and 12-bolt Chevy rear ends. 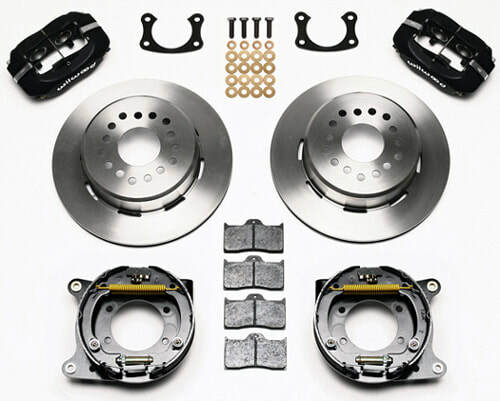 This kit features 11'' Rotors, brand new Cadillac calipers loaded with pads. All brackets and hardware included. 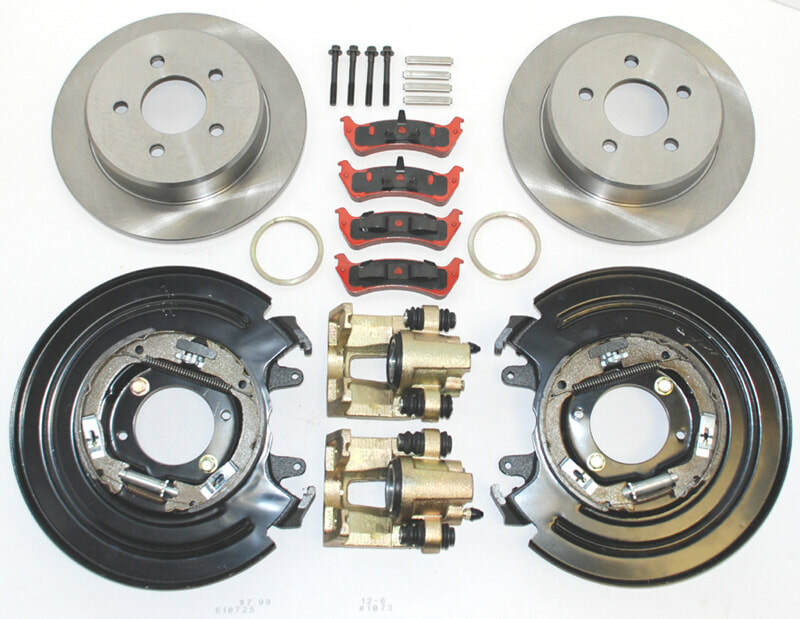 Pro-Series rear disc kits provide a complete solution for popular muscle car rear axles that require a parking brake. Forged billet Dynalite four piston calipers, 12.19” one-piece drum/rotors, and high friction pads provide optimized and balanced braking for all types of custom performance street/strip and show machines. The neatly hidden internal shoe system provides a clean installation with superior static holding power for parking. Optional caliper finishes and rotor designs enable the builder to personalize the style and optimize brake performance for every individual application. 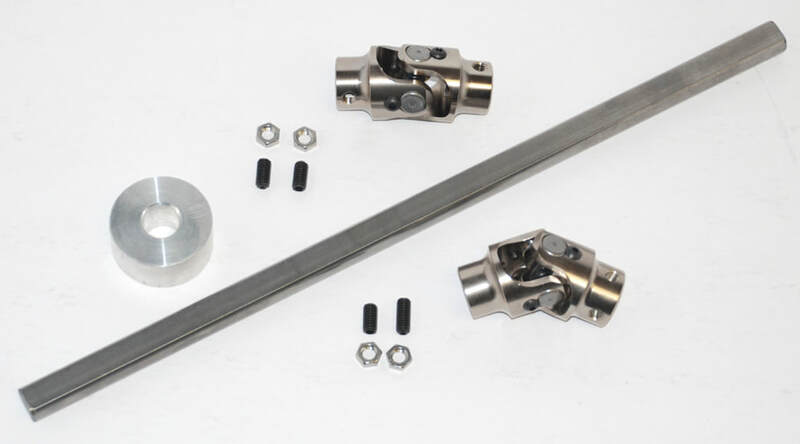 Our Ford SVO rear brake kit features emergency brake built into the rotor hat. Kit comes complete with pads and all brackets. Fits new style big bearing Ford 8 or 9-inch rear ends. 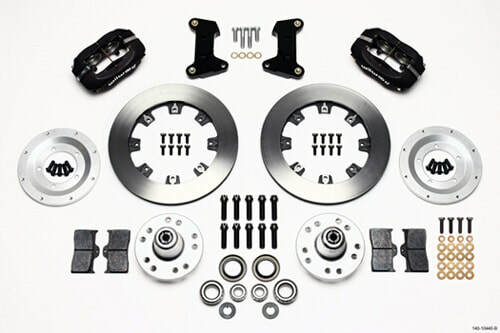 We now offer a full selection of awesome Wilwood front and rear disc brake kits! 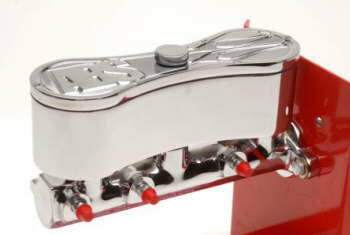 REMEMBER - We also carry a passel of pedals, many master cylinders, beaucoup boosters, plenty of proportioning valves and a right smart of residual valves for ALL your braking needs. CALL 970-255-8890 with your specific application! 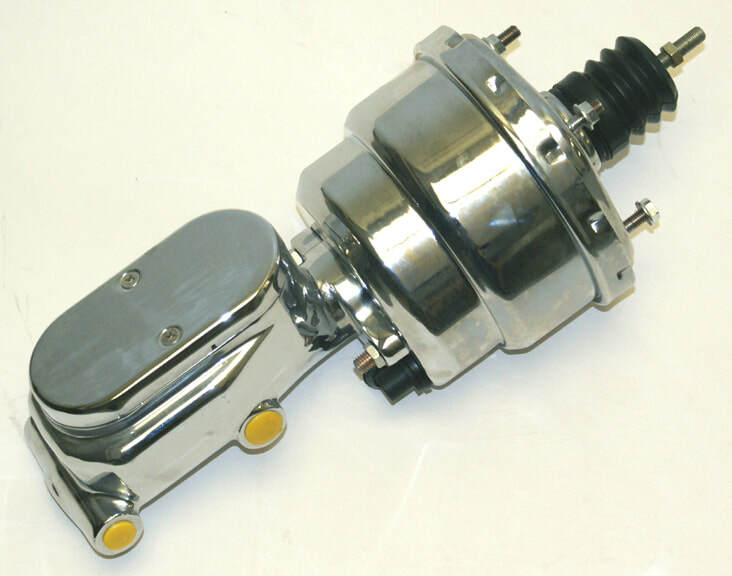 ABS Power Brake’s new electric power brake system uses a compact electric power supply that is the source of the boost. 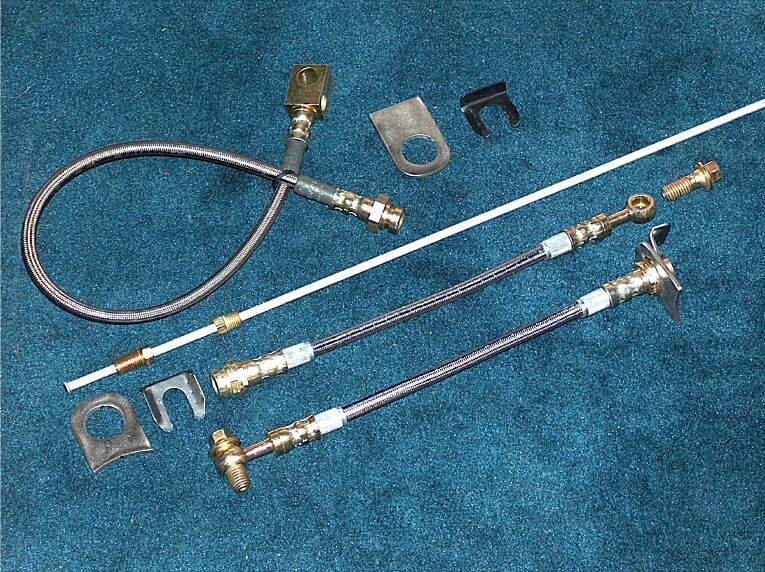 No bulky booster and no proportioning valve is needed. Designed for easy installation, great looks and even better performance. Many applications available. 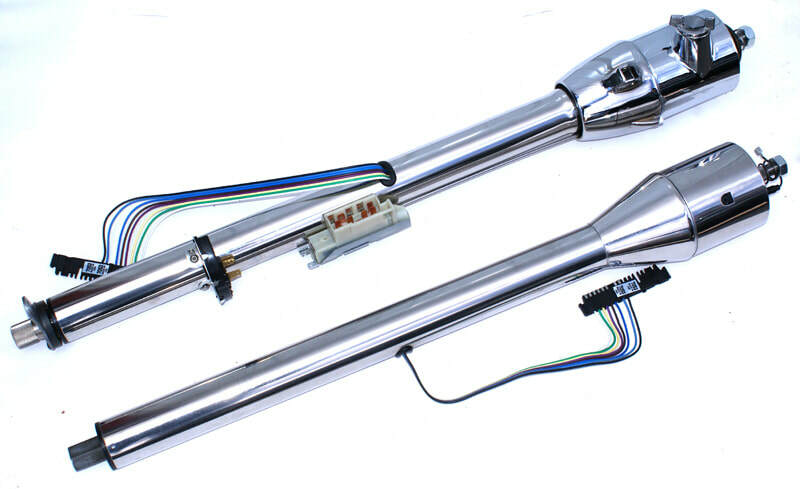 Full Tilt can help you put together the very best braking system for your riding - and stopping - pleasure! Call Clay at 970-255-8890 and take advantage of his ?? years experience! 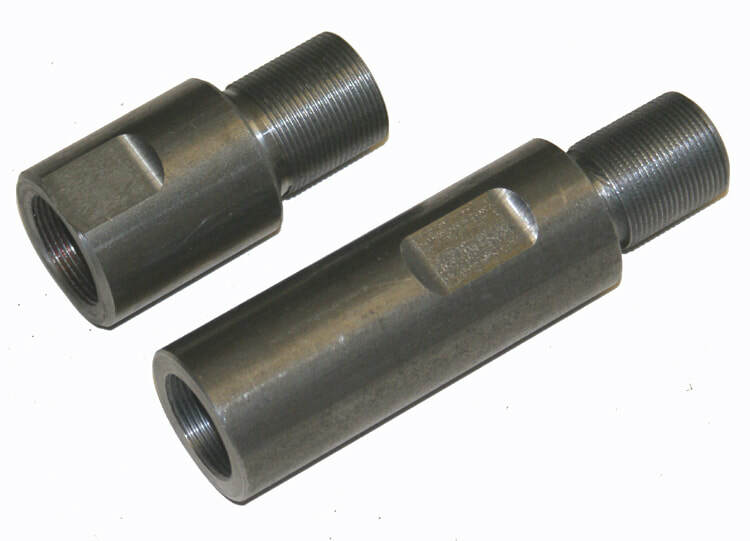 Flaming river rack-and-pinions are available in manual and power versions. 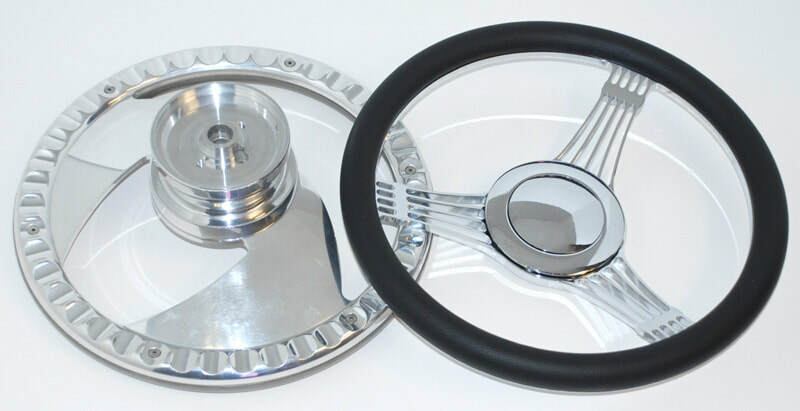 And don't forget to ask about our low-low prices on top-quality, awesome-looking steering wheels. 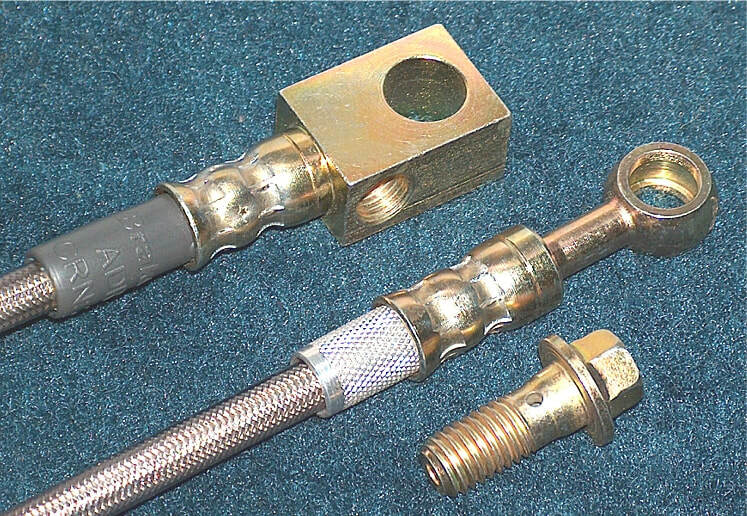 We carry Flaming River's complete line of billet single and double universal joints plus their great vibration resistors.